Background: Enzyme cycling is a sensitive assay method that exploits amplification techniques. We recently developed a novel enzymatic cycling method, which utilizes both the forward and reverse reactions of creatine kinase (CK), for the quantitative determination of creatine. Objective: Our aim was to develop a novel enzymatic cycling method to measure pyruvate or phosphoenolpyruvate using pyruvate kinase (PK), which exploits a similar principle to that of the CK assay. Methods: The method was developed by utilizing the reversibility of the PK reaction, in which the forward (pyruvate forming) and reverse reactions are catalyzed in the presence of an excess amount of IDP and ATP. Spectrophotometric real-time detection was accomplished by coupling the reaction to ADPdependent glucokinase (ADP-GK) together with glucose-6-phosphate dehydrogenase (G6PD). The rate of increase in absorbance of NADH at 340 nm was monitored. Results: When using PK from rabbit muscle (RMPK), we observed that the efficiency of the cycling reaction was markedly enhanced when Mg2+ was replaced with Mn2+. Unexpectedly, steady-state kinetic analysis of the reverse reaction alone coupled with ADP-GK and G6PD revealed the initial velocity was accelerated by approximately three-fold upon addition of IDP or GDP. This activation was not observed when Mg2+ was used as the divalent cation. 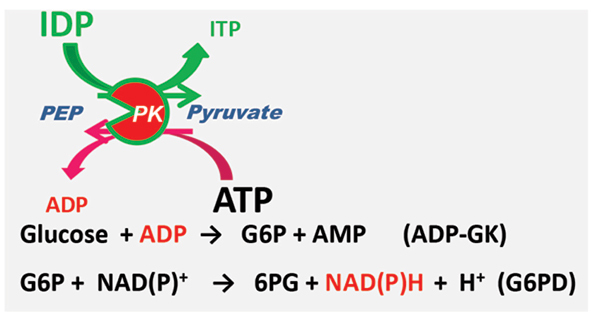 Conclusion: We have developed a novel enzymatic cycling method mediated by RMPK, which utilizes the reversibility of the reaction in the presence of an excess amount of ATP and IDP with Mn2+. The limit of detection was estimated to be 12 nM. Enzymatic cycling, pyruvate kinase, pyruvate, phosphoenolpyruvate, ADP-dependent glucokinase, real-time detection.